A friend of mine lives in the Amsterdam neighbourhood “De Pijp” and works outside Amsterdam. Like many people who live in the centre of Dutch cities he doesn’t own a car and so he gets to work by train. At least according to the statistics, because the largest part of the distance is covered by train. In reality, however, he combines that train ride with a bike ride. In the Netherlands over 40% of all train travellers get to the train by bicycle and he is one of them (as I am). He surprised me with a video of his ride to the train station and allowed me to use it on my blog. 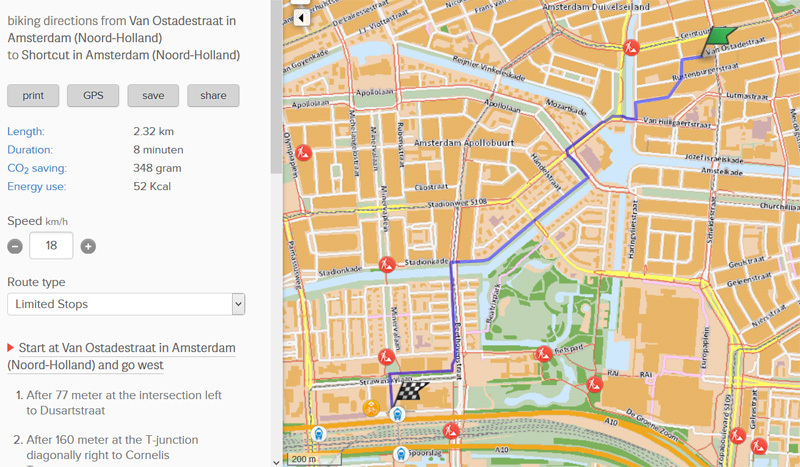 So I can now show you a genuine 8 minute commute by bicycle in Amsterdam. The neighbourhood bicycle parking facility now, in a former shop. 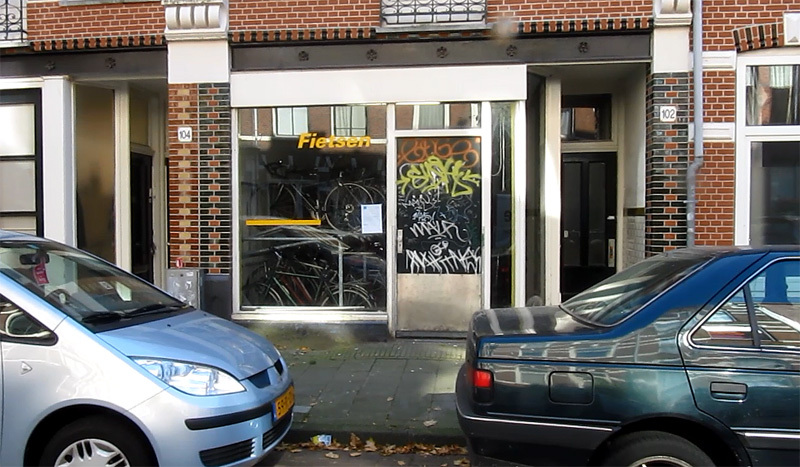 It says “Fietsenstalling” (bicycle parking facility) over the shop window. The facility has an electronic door. I had photographed this very facility a few years ago. At that time it didn’t look so nice. They have since given it a new door, a new sign and a lick of paint. Maintenance is something the Dutch are good at. This is the ride on his way to work. So he starts by getting his bicycle from the neighbourhood bicycle parking facility that he has a subscription for and that is situated within walking distance from his home. For the fee of 14 euros a month he can park his bicycle inside. There are 44 such neighbourhood bicycle parking facilities in the South of Amsterdam alone. 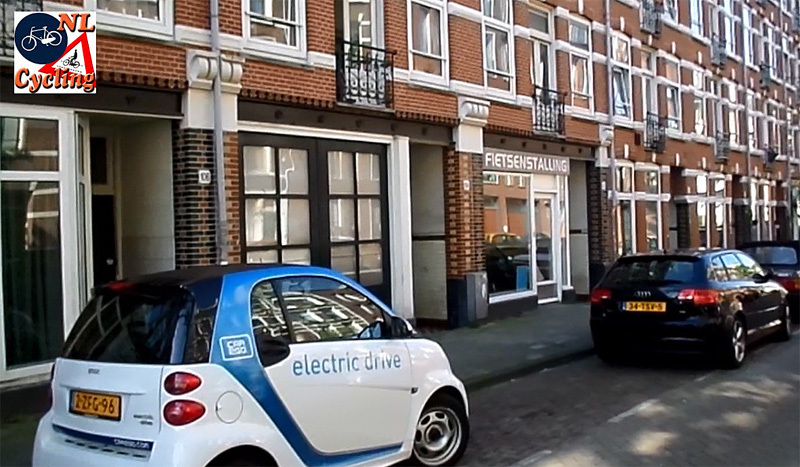 Using such a facility has several advantages over parking your bicycle in the street. First of all you can be sure to have a parking place at all. If all the street racks are full you may have to walk a long way to find an open spot. Interestingly enough it is officially forbidden to lock your bike to poles and bridges in Amsterdam (even though you’d have a hard time finding a bridge or pole without a bike attached to it!) Secondly it is better protected against the elements. If you have to park your bicycle outside day and night it would suffer from especially the rain. Thirdly it cannot be damaged by drunks or other idiots that roam the streets at night when it is not out on that street. Lastly it cannot be stolen so easily. To enter the facility you get an electronic key. 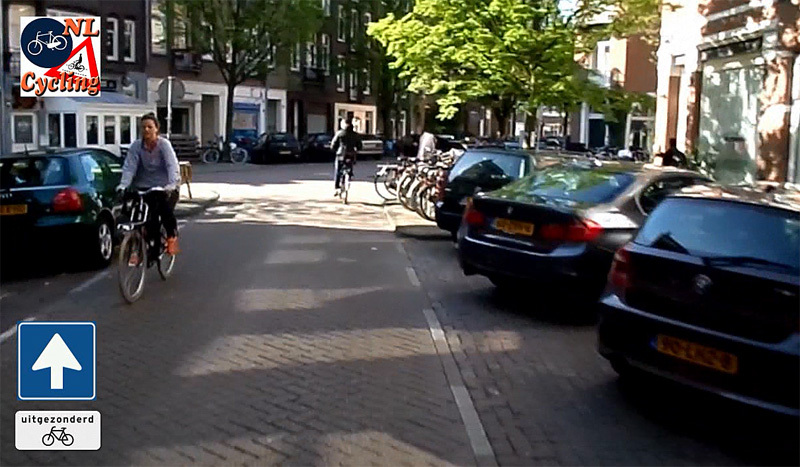 The residential streets in “De PIJp” are all one way for motor traffic and two-ways for cycling. The area is also a 30km/h (18mph) zone. A dedicated left-turning lane in the cycleways. So a number of people can stand there to wait for the light without being in the way of people wanting to go straight-on. When he leaves the residential area, he gets to through streets and those streets have separated cycling infrastructure. For a short stretch that is an on-street cycle lane, but most of the time they are one-directional cycleways on either side of the road. The standard for streets with a lot of end-destinations on either side of the street. 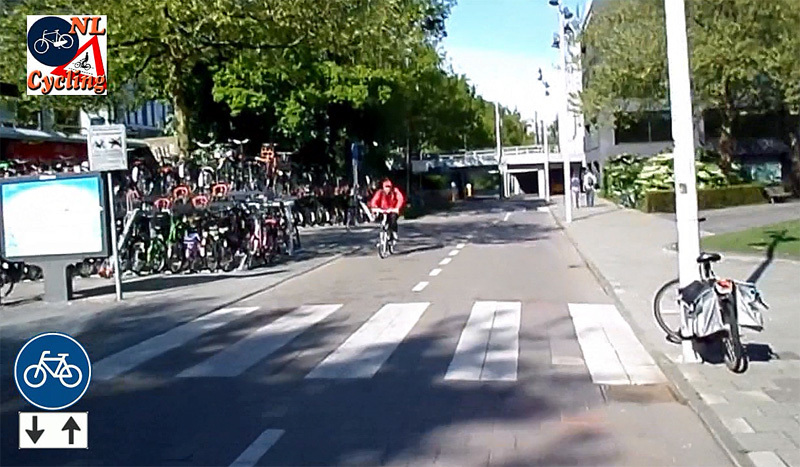 The number of traffic lights in this 2.3 kilometre ride is very low: just 3, of which only 1 is really red. The other two turn green at his approach. 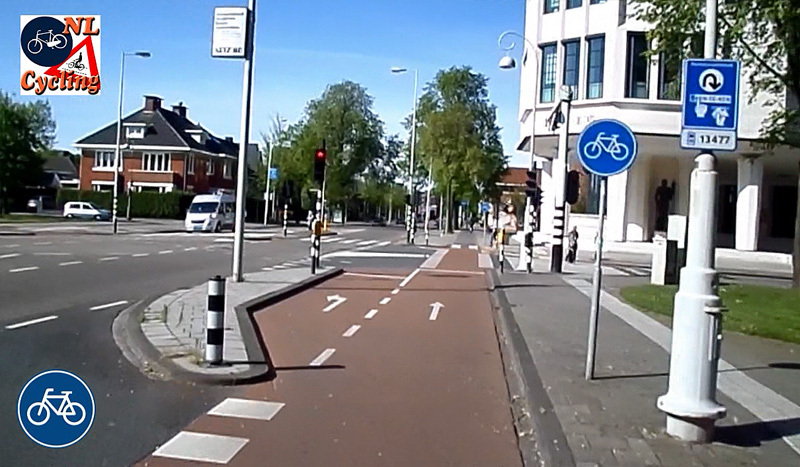 At 4:23 we see a left turning lane in the cycle way (also pictured above). This gives people the possibility to wait for the light to turn green out of the way of people going straight-on. That is no luxury in rush hour. This crossing of a side-street is very clear about who has priority. Cars crossing the cycleway (from all directions) have to give way to cyclists here. Another residential area that is in a 30km/h (18mph) zone. 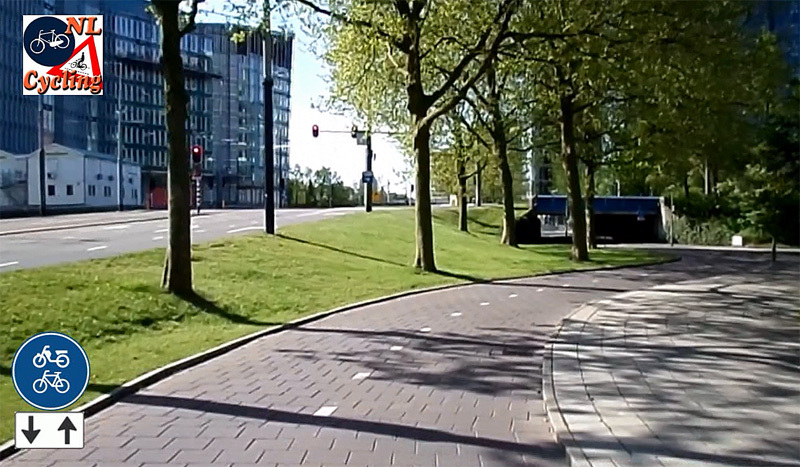 This part is one way for motor traffic and two ways for cycling. 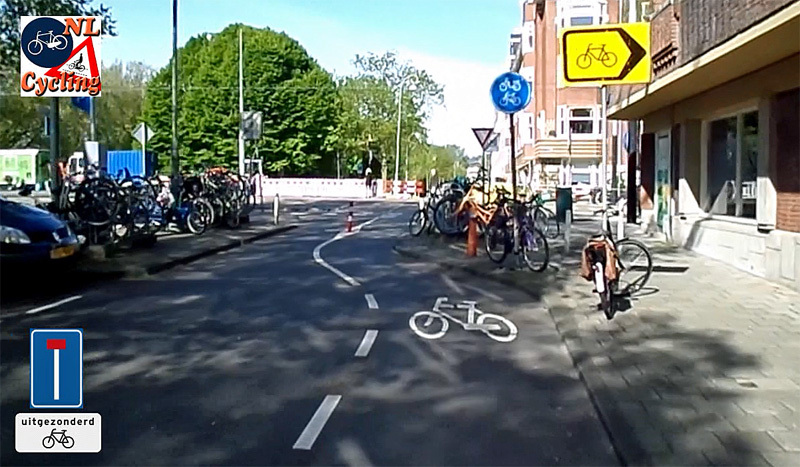 Amsterdam chooses to indicate that with a sign “closed to motor traffic”. This is not so usual in other cities. 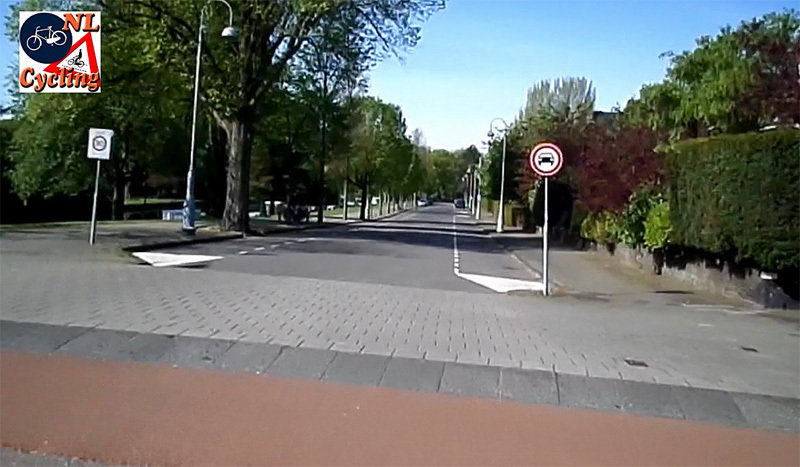 Three ways to indicate the fact that a street is one-way for motor traffic and two-ways for cycling on the end that is closed for motor traffic. 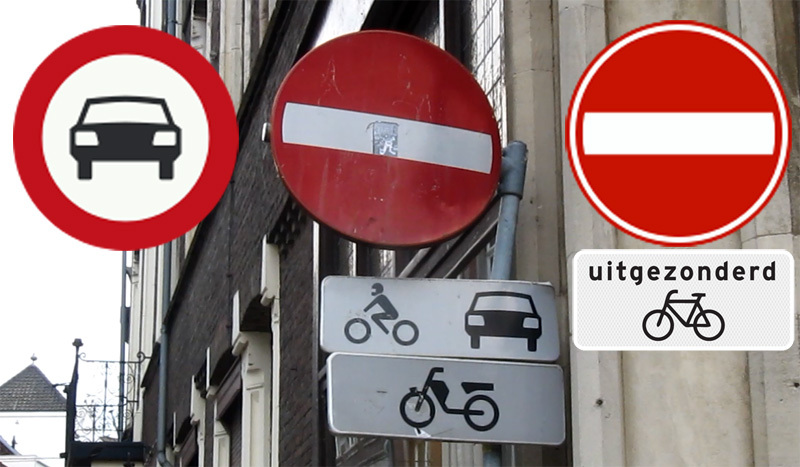 Left: Amsterdam, ‘no entry for motor vehicles’. Centre: Maastricht No entry from this end, with sub-signs that mean “only for motor traffic”, Right: the more standard way, a no-entry sign with a sub-sign saying “cyclists excepted”. Apparently Amsterdam and Maastricht needed a way to make this clear without words, because they have a lot of road users that do not speak Dutch. A short cut for cycling. The sign at the bottom left was at the beginning of the street. It means “Dead end, except for cycling”. The yellow sign with the bicycle indicates a detour if you need to go straight-on because that road is closed. But my friend turns left here so he does not have to follow the signed detour. Only when he gets outside the narrower street pattern at 8:08, and into an area that was designed after the 1970s. He gets to see bi-directional cycleways. You see from that point that the roads for motor traffic were raised and that the infrastructure for human powered transportation (cycling and walking) stays on ground level. The number of intersections with motor vehicles gets reduced to almost zero and that makes bi-directional cycleways possible and safe enough. The surface of the cycleways (concrete tiles) gives away that this is an older type of infrastructure. The cycleway moves away from the roads from motor traffic here. These motor traffic roads are raised while the cycleways stay on ground level. The rest of the junctions are all grade separated. The tiles give away that this is from around the late 1970s early 1980s. This may seem like a normal street to some, but is is a cycleway. We do sometimes have zebra crossings on cycleways. We don’t really get to see the railway station, but the bicycle parking facility is almost right under it. You get to the lower level with travelators in a very convenient way. The facility is manned and thus guarded and your bike is marked with a paper tag of which the customer gets the matching other half to reclaim the bike later. You park your bicycle yourself. When you later want to leave the facility you have to show that the tag on your bike and the other half match, with which you prove your bicycle is really yours. This is a system that has been in use for almost a hundred years in The Netherlands. Simple and effective. But it takes a lot of time to tag all the bicycles. That is why in morning rush hour there can sometimes be lines to get into the facility. In more modern facilities like the one I showed in Utrecht, you swipe your public transport chip card. That is much faster. 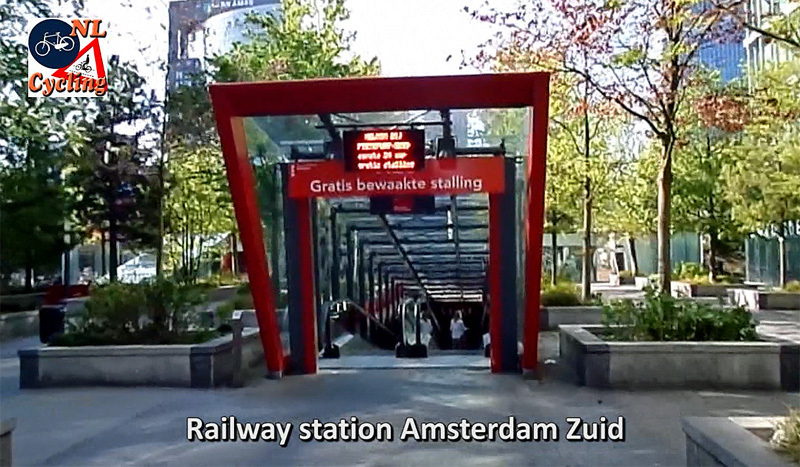 The entrance to the free bicycle parking facility at Amsterdam Zuid railway station. The convenient travelators to get to the lower level of the facility. There is a lot of day light in the facility. 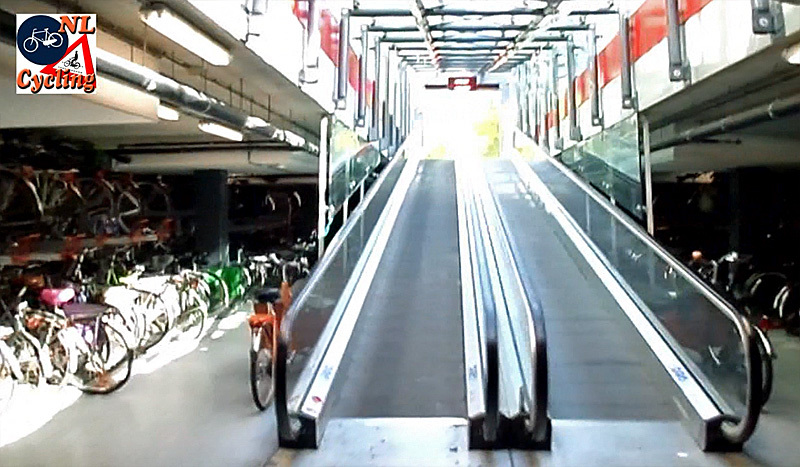 From the parked bicycle you can walk to the train platforms in under two minutes. So that makes the entire commute to the train about 12 minutes, including getting the bicycle from the neighbourhood parking facility and parking it in the public facility under the station. This is a very convenient part of his commute and you could never be this fast if you would take public transport. The rest of the commute is made by train and that is also very time efficient, often quicker than going by car. No wonder so many people in the Netherlands use the bicycle to get to the train. Map of the full ride. (From the Route Planner from the Cyclists’ Union). In the past I used to drive with the scooter from Weesp to Amsterdam and back, now everybody travels with his bike on train, we need longer trains, bigger stations etc. Very nice, I live in the Amsterdam area and I am very familiar with neighborhood “de Pijp”. In the past I used to drive with the scooter from Weesp to Amsterdam and back. However, I realized that a scooter produced even more Utra Fine Dust then a truck. So I changed, I park my van at the edge of Amsterdam, I take my bike out of the back. And I cycle into the city. It only 6 km/ 4 miles to the centre/ downtown. And I get exercise with less pollution. OK, taking the train is better, but it is time consuming. If filmed in my city, the route probably would have been a straight line with only one or two turns due to the street grid. I like the idea of having quite bike routes away from vehicle traffic, especially if it means creating short-cuts for bikes that don’t exist for cars. I can think of a handful of such potential opportunities in my neighborhood but I don’t think it will ever happen. The bike advocates will say we should focus on direct routes on major streets. The planners will say that it’s not worth it to make such changes to low traffic streets. The fire department will protest anything that is more than paint. The politicians and their staff will say there’s no funding source or that there must be wide consensus first. That said, great video, I liked that it gave a real glimpse of conditions in a very dense, built-up area. And such pretty streets, love the trees! And the bike parking at the beginning is cool! Thanks to you and your friend! No, we keep our bikes at our homes just like all our other possessions! I’m lucky enough to have a garden with a garage, but some friends have shared storage facilities in blocks of flats. Storage can be a problem, and you see quite a few bikes in hallways blocking the stairs or on the balconies of apartments (although some building management companies ban this). So I’m surprised residents of Amsterdam don’t have better provision. Doesn’t your friend have a place at his home where he can store a bike? 14 Euros a month seems like quite a lot for something which could/should be free, and “within walking distance”? I want to get on my bike outside my front door – that’s the point! Home side bicycle parking is generally organised very well in this country. I described it in an earlier blog post. Except for some older neighbourhoods like this one. Dutch bicycles are about 20-25 kilos and you don’t want to carry that up three floors. If that is even possible. These hooks to hoist objects up outside the homes are not there for nothing. The stairs are so steep, winding and narrow that it is impossible to carry up large items and that includes bicycles. So then a neighbourhood parking facility is a good solution, but it is the exception rather than the rule. Hallo Tim, the residents of Amsterdam don´t own a private space for storing bicycles. The reason is that the houses were built before the building regulation came into effect. However, houses built after 1950 have a storage space for bicycles. My flat has one on the first/ street floor and my new home has a separate shed. Lovely! Oh, there is a clip about storing your bicycle at home, on this site. That is quite a contrast indeed. Just the fences already along what should have been quiet back streets in my eyes. A different world. In Germany we have a (big) discussion around cyclist, whether it’s better to have more posibilities to go by train WITH your bicycle or to have secure bicycle parking facility at all trainstations. I like to travel on train WITH my bicycle, but if everybody travels with his bike on train, we need longer trains, bigger stations etc. Some things are not scalable. If only a few people do it, then you can have bicycles on the train or on a front bus rack. But with the numbers we have here in the Netherlands you would indeed need longer trains. Here the discussion is whether people should use shared bikes rather than their own to get to the stations. That, to ease the parking problems. Taking bicycles on the train is not a topic here. Everybody understands that that is simply not possible when almost half of all travellers arrive by train. Check out “OV-fiets” clip on this site. I see the possibility of a series of contributions from your readers from all over the world. Film your daily trip by bike to commute from home to work. This could include the train/bus part as well. How long does it it take and which logistic steps and actions do you have to take? 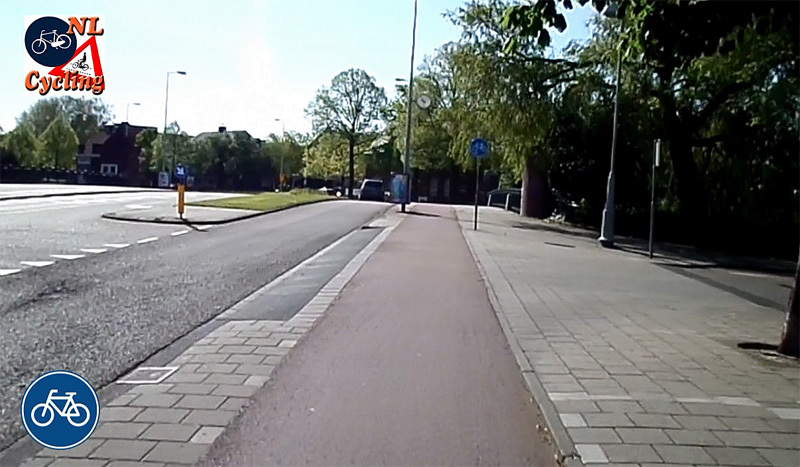 Surveys shows that cyclist make very precise calculations about the road taken, the way to avoid traffic lights, where you park your bike and which other means of transport you choose. These choices also depend on the weather conditions. And a minute or more can make a difference in the total of choices. It would be interesting to compare more contributions like this and learn from each other. It makes it easier for people who use a car for commuting to think about the alternative. So I would like to call out for more readers to film their daily commute trip and share it with us. Another remark about the public bicycle parking facilities in the neighborhoods. They are quickly disappearing. It used to be a nice way to earn some extra money by house-owners with an extra room or basement. Former interior parking facilities are all tranformed to regular houses nowadays because that’ s more lucrative for the owner. In my neighborhood Watergraafsmeer, in the east of Amsterdam there is hardly any one left. Local government is trying to bring them back by formal legislation. An initiative of bicycle-organisations. Note to all the transport designers out there, the length of the dropped kerbs and transitions on/off tables. 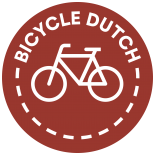 This entry was posted on 29 May 2015 by Bicycle Dutch in Original posts and tagged Amsterdam, commuting, cycle parking, railwaystations, residential cycle parking, ride.